Summer fashion in India has always been about light fabrics. For the intolerable heat of India, it’s important to wear clothes that let you breathe. It’s also important to package this comfort in trendy styles. After all, why should your sense of style diminish just because winter is over? Here are nine Indian brands that have exquisite summer collections for women. Known for their contemporary, comfortable styles, AND has lived up to this reputation in its summer 2019 collection as well. Their latest collection is all about matching flowing fabrics with smart silhouettes. If you’re looking for affordable, comfortable everyday wear, Global Desi is the place for you. A part of design legend Anita Dongre’s company, Global Desi aces summer fashion in India with bright colours and light fabrics. An internationally renowned designer, Varun Bahl has brought his unique touch and expertise to the brand’s summer 2019 collection as well. From elegant wedding wear and formal Indian wear to everyday work wear, you’ll find it all under this label. Pranay Baidya prides himself on bringing his Bengali heritage to the forefront with his designs. His summer 2019 collection is playful, vibrant and classic. Perfect for summer weddings and parties. Click here to shop the collection available at Pernia’s Pop-Up Shop. 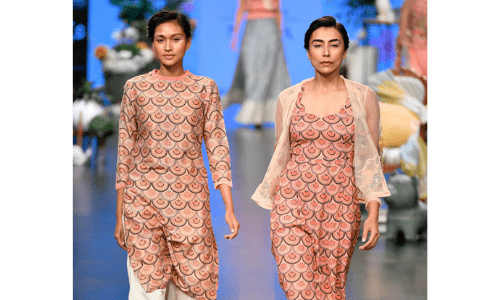 Known for their contemporary take on Indian outfits for women, BIBA’s collection for summer 2019 is an assortment of trendy patterns on typically Indian silhouettes. The retro vibe is strong with this collection which combines florals and bright colours to create a cheerful look. Sanya Gulati combines quintessential summer colours with light fabrics to create comfortable formal wear. Going beyond the regular cottons and linens, Sanya Gulati has reimagined summer fashion in India with a touch of bling. From mid-length dresses, gowns to traditional Indian wear, Surendri by Yogesh Chaudhary has it all. And they’re all suited for the blistering hot summer of India. Pankaj and Nidhi describe their summer 2019 collection as “crafted from the finest of feel-good fabrics and embellished with handcrafted beadwork and embroidery.” Look at the pictures below, and you’ll know that the artistry is truly exquisite here. Retaining classic designs in summer fashion in India, Good Earth’s latest collection has a calming vibe to it. Quite like a sleepy summer afternoon. With their apparel line titled ‘Sustain’, the brand is trying to give a new lease of life to Indian craftsmanship. Summer fashion in India is evolving with every new collection. We’re looking forward to more breezy designs and playful silhouettes. Are you?